← Sharon Springs to Celebrate with a Garden Party Festival! Have you ever eaten at a Food Truck? Well, more and more people are and you can sample some of the Capital Region’s best on May 4 in Saratoga Springs! Besides the food trucks there will be kids’ activities, live bands and arts and crafts. 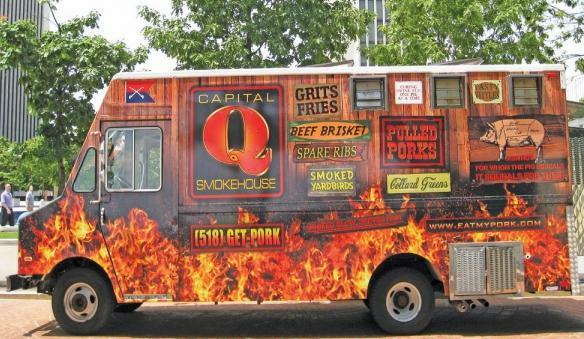 Get a full line up of the 10 trucks that will be there for your enjoyment by clicking below. 10 local food trucks are kicking off their 2014 showcase season hosted annually by The Saratoga Eagles’ Club! Saratoga Springs Turns Back The Clock For A "Victorian Christmas Streetwalk" (VIDEO)In "Arts"
This entry was posted in Saratoga County, Uncategorized and tagged food truck festival, saratoga. Bookmark the permalink.